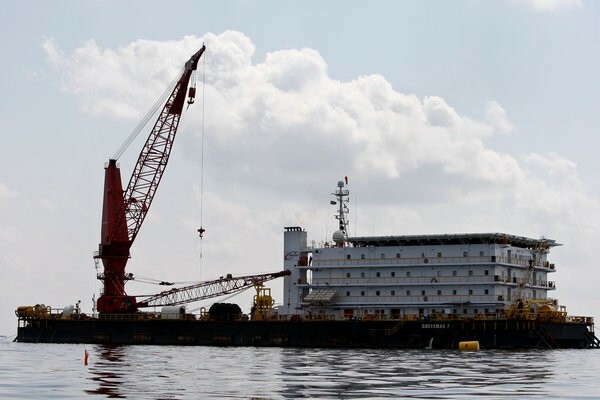 There have been a number of mentions in the press lately regarding the use of Flotels or floating living quarters to house the workers aiding in the cleanup of the Deepwater Horizon oil spill in the Gulf of Mexico. First, let us say this is a tragic event that will take a toll on people and wildlife in the Gulf coast region for years to come. We hope that the current efforts to cap the oil flow hold, and recovery efforts can will offer a positive impact to reduce the damage to the ecosystem. We certainly sympathize with all the people who depend on the gulf for their living and understand the extreme duress they are enduring as fishing grounds have been closed and tourism has been curbed. Our best wished go out to all those affected. Despite the ominous circumstances that surround the deployment of these floating living quarters, we did want to mention the use of bunk curtains like those offered through Curtain-Tracks.com. These bunk curtains, or berth curtains, provide privacy for those sleeping in an area shared by multiple individuals. They are simple and effective way to allow crews to sleep during the day on rotating shifts since the curtains are typically made using light blocking Eclipse fabric. These type living quarters with multiple bunks in a shared area are commonly used in the energy industry. 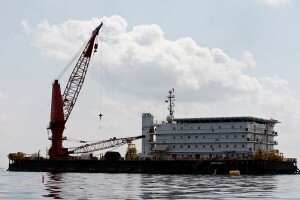 Prefabricated or modular living quarters are used on oil rigs and in man camps all over the world. 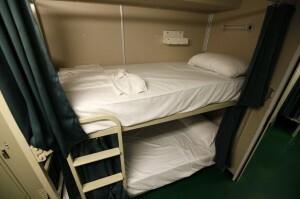 These bunks and curtain configurations are also similar to how the sleeping quarters on ships and working boats are outfitted as well. Curtain-Tracks.com stocks a single sized bunk curtain constructed with Eclipse fabric (98% light blocking, fire retardant, machine washable) in navy blue. These stock curtains are 48 inches wide x 36 inches tall, and feature 3091 snap tape that works well with the 7120 snap carriers which are compatible with a variety of curtain tracks including the 52124 curtain track. These bunk curtains are typically used in sets of two (two curtains on the side of the bunk) or three (two curtains on the side and one at the head or foot of the bunk). We also offer custom sized bunk or berth curtains to meet a customer's specific requirements. These can be fabricated using a range fabric colors and can be made to specific sizes. The lead time on customer bunk curtains is typically 2-3 weeks. Feel free to contact us if you need help in determining what option may best meet your needs.